Tecno has decided to disrupt the Kenyan market with the launch of their newest entry level Android product offering, the Tecno N3. This is a dual-sim device that has all the basics met, from dual standby, battery, Android version, storage and design. Tecno has previously introduced Android devices for the low end and has Techno T1 and T3 already in the market. Several months ago, Tecno was known as the mobile vendor for grey market and dumb phones was their forte, not anymore. The market that devices like Huawei’s Ideos, LG’s L3, Samsung’s Galaxy Pocket, and Nokia’s Asha range all scramble for a share of is the same market Tecno targets. The youth wishing to move to smartphones but with budget restrictions. Priced at Kshs. 8000, Tecno N3 fits in quite well with the Android 2.3 Gingerbread, 3.5″ HVGA capacitive touch screen, 800Mhz device running Qualcomm’s Snapdragon S1 MSM7225A processor. The 3G smartphone device it that the N3 is, has a nice design and powered by a 1400mAh battery ensuring this to be a device you can take mainstream for your long day activities. Tecno launched this device in partnership with Qualcomm in a program called Qualcomm Reference Design that enables device vendors get 3G smartphone devices developed fast. Qualcomm saves device vendors the task of research and development, product architecture and engineering costs making the production duration cheaper and faster. “A device that would require a year and more from design to production usually takes less than 60 days with Qualcomm’s partnership. 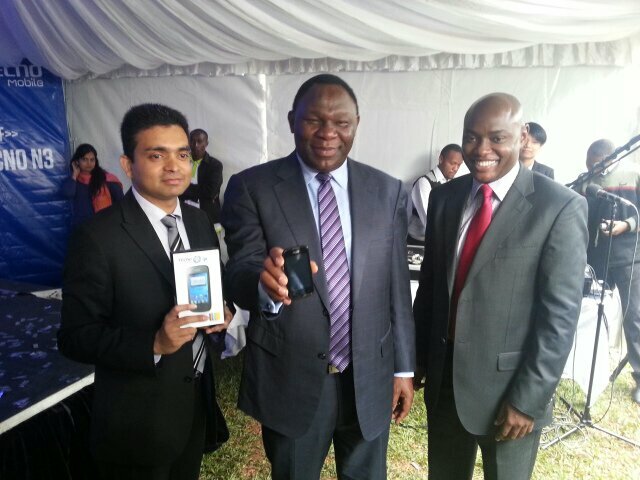 The cost impact is also pushed down to the consumer, making the 3G smartphones enter the market at a cheaper price. At the same time getting a device that is of good standards to consumers,” said Billy Owino, Regional Head at Qualcomm Inc.
Tecno N3 comes with some preinstalled appslike Flash share that allows users to share files quickly across devices via Wi-Fi. This app allows you to slide a picture across a screen of one phone to the next. Palm Chat is another app that allows users to chat across devices and platforms, finding friends on this app is as easy as shaking the phone. The 1400mAH battery is a good and will give a few days of use when the CPU is underclocked and network restricted to EDGE. I am looking out for user reviews on this phone, checking out if it will get the ideos-like success. Christiano, my review should be coming out in a short time, I have had this device for a day now. I hope am the first to comment on that, make it nice.